- It has been quite a journey for Haywire. Formed three decades ago in Charlottetown PEI, the rock band has gone on to sell more than half a million records, spawned a dozen hit songs, won international awards and played with some of the biggest names in Canadian music. It all culminated for band members Paul MacAusland, David Rashed, Marvin Birt, Ron Switzer and Sean Kilbride in 2006 when Haywire received the Music P.E.I. Lifetime Achievement Award and again in April 2011 when the band was honoured by the East Coast Music Awards in Charlottetown with the Dr. Helen Creighton Lifetime Achievement Award. Some people might take that as a sign the band’s career has reached an end. That isn’t the case with these ‘bad boys’. The band is currently writing new material with plans to celebrate its 30th anniversary with a new album later this year. MacAusland, Rashed, Birt and Switzer formed Haywire in 1981 (with original drummer Scott Roberts) and began touring Atlantic Canada a year later. It was clear the band’s future was bright when it captured one of the biggest rock contests in the region, the Q104 Homegrown Contest, raising the band’s profile. The momentum continued in 1985 when Haywire took first place in the Labatt’s Battle of the Bands in Saint John, N.B., walking away with $10,000. The band used the money to finance a self-titled five-track EP, peaking the interest of record companies, Rock fans took notice, too, snatching up all 5,000 copies that were produced. Music Express Magazine dubbed them ‘Canada’s Best Group’ in 1986. Attic Records took notice and signed the band to a five-album record contract that year. That’s when Sean Kilbride jumped on board. 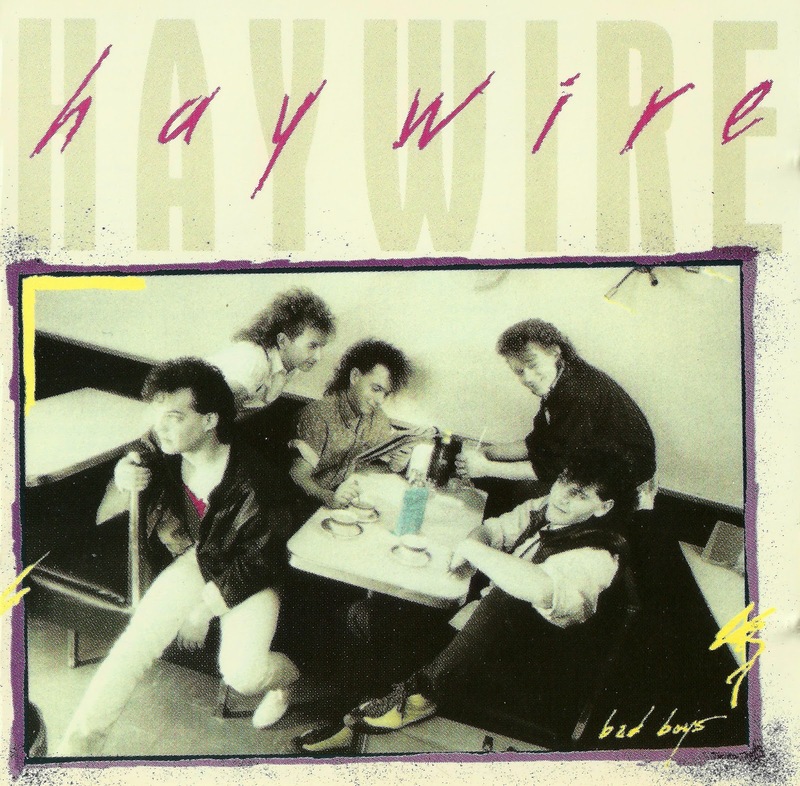 Haywire went into the studio and walked out with its first album, ‘Bad Boys’, that same year. ‘Bad Boys’ produced three radio hits — Bad Bad Boy, Standin in Line and Shot in the Dark — and sold more than 200,000 copies in Canada. The album was also quickly certified double platinum. Riding the wave of popularity, the band quickly went back into the studio after coming off tour and recorded their followup —‘ Don’t Just Stand There’. ‘Don’t Just Stand There’ was certified gold (50,000 copies sold) in only four months and would eventually surpass double platinum status (200,000 copies sold). The album also produced three more hit singles that can still be heard on radio today — Dance Desire, Black and Blue and Thinkin’ About the Years, the latter of which became an instant classic with high school graduating classes and recognized in 1988 as Canada’s most played song. Later that year, Haywire had the honour of representing Canada at the World Popular Song Festival in Tokyo, performing its hit Dance Desire. Not only was the song a top-10 radio hit in Canada, judges at the contest liked it so much they awarded the P.E.I. rock band the Golden Award. What followed over the next two years were countless live shows with a who’s-who of Canadian music — Kim Mitchell, Helix, Corey Hart and Honeymoon Suite. MacAusland, Rashed, Switzer, Birt and Kilbride were living the dream but the band knew the time was right to take the next step and stretch its legs a bit. They wanted a more guitar-driven heavier sound, one which matched the energy the band created in its live shows. They also wanted to expand their fanbase. Knowing that was going to take all their focus and energy, the band flew to Norway to concentrate and think about nothing except the third album. Haywire released ‘Nuthouse’ in 1991, an album which opened new doors for the band. It was also a hit with audiences, selling more than 50,000 copies, certifying the record gold. ‘Nuthouse’ gave birth to singles Short End of a Wishbone, Operator Central and the ballad Taken the Pain, a song that MacAusland and Birt performed unplugged to critical acclaim on MuchMusic. The album produced singles Get Back and Wanna Be the One as well as the ballad Buzz. Despite all the hits the band had produced over the years, Buzz proved to be among the band’s most popular radio hits. Buzz remained on heavy rotation at radio stations across the country for weeks, becoming the band’s most played single and skyrocketed up the charts, peaking at No. 13 in Canada. The band’s label chose to release ‘Wired’, a compilation of hit singles in 1993 to complete the contract. MacAusland, Rashed, Birt, Switzer and Kilbride chose to take some time off, pursuing other interests for the next few years before reuniting on New Year’s Eve in 1999. The show, held at the old Myron’s nightclub in Charlottetown, proved the band hadn’t missed a beat. Interest in Haywire started to grow again, evidenced by sold-out shows in Charlottetown just a few years ago. It wasn’t long after the band started talking about the future again. - Charlottetown's HAYWIRE, founded during 1982 in the salubrious surroundings of Smitty's Pancake House no less, made the transition from Pop to a melodic Hard Rock, finding acclaim in their homeland. 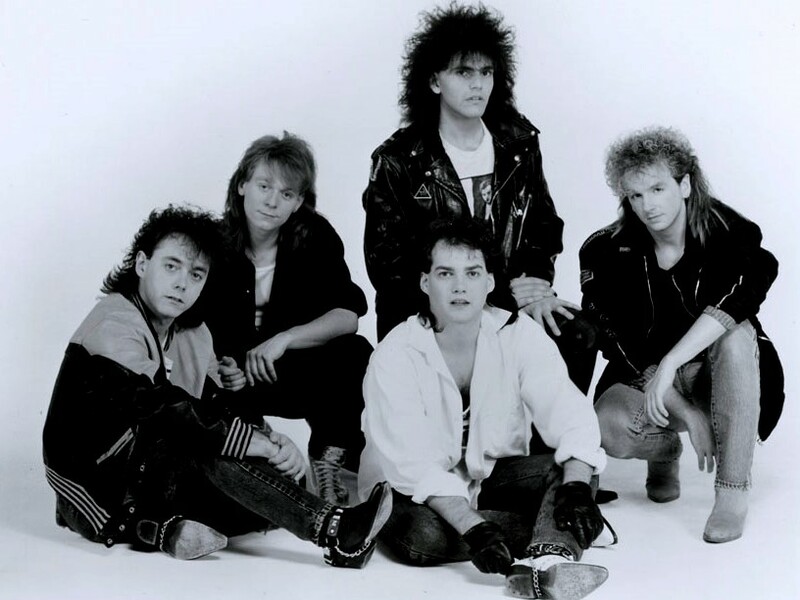 The group, comprising vocalist Paul MacAusland, guitarist Marvin Birt, bassist Ronnie Switzer and keyboard player Dave Rashed, ditched original drummer Ron LeBlanc with Sean Kilbride of BROKEN TOYS in late 1985. In their formative years HAYWIRE won a succession of talent contests, utilising the cash prizes to fund recording of an EP and further material, which duly secured a recording contract. The band's debut album 'Bad Boys' saw production from TORONTO's Brian Allen. The album gave the band a monster hit in their homeland, spawning three hit singles and going platinum too. Nationwide touring to promote 'Bad Boys' had HAYWIRE paired with KIM MITCHELL. Retaining the services of Allen as producer once more the band took to the studio in May of 1986 to cut the follow up 'Don't Just Stand There'. The song 'Dance Desire' landed the band another singles success. The following year HAYWIRE was to represent Canada in the World Popular Song Festival held in Tokyo, Japan. 'Dance Desire' duly scooped the golden award for 'best song'. For a third album the band relocated to Norway to lay down 1990's 'Nuthouse' with Bjorn Nessjoe of the STAGE DOLLS. - Haywire is a Canadian hard rock band originally from Charlottetown, Prince Edward Island, Canada. Haywire formed in Charlottetown in 1981 by David Rashed, Paul MacAusland, Marvin Birt, Scott Roberts and Ronnie Switzer. In 1984 they won the Q104 Homegrown Vol. 1 contest; the first prize was the chance to record a single, but they took the opportunity to invest their own money and record a 5-song EP, which eventually sold over 5000 copies in the Maritimes. In 1985 they won the Labatt's Battle of the Bands, and used the $10,000 first prize to record more material. While most of the members of the band had been unaltered from the start, drummer Sean Kilbride was the fourth drummer in the group's short history. Ron "Bumble" LeBlanc had replaced the original Haywire drummer Scott Roberts in 1984. He remained with the band through their demo stages, EP, and can be heard playing on two cuts of the band's first record with Attic. LeBlanc was replaced by Mac Cole when he decided to move on from the group and pursue a formal education. Cole only played two months with the band, when Haywire's long-time friend Kilbride became available for the job. In the summer of 1986 the group signed up Kilbride and successfully pursued a record contract with Attic. Their first full-length album, Bad Boys, went platinum in Canada, while the title track became a Top 40 hit. Laurie Mohammed, Actress appeared in the video. She now lives a private life in Toronto and is Mother to two children. In 2015, she remarried and resides in the Toronto area. The following year, they released Don't Just Stand There, which also went platinum and contained their highest charting hit, the hard-driving "Dance Desire". A promised third video was not forthcoming from the label, so Haywire financed the video for "Fire" themselves. Although this showed great initiative and conviction by the group, this inexplicably did not please Attic. Throughout the late 1980s, Haywire toured with other popular Canadian rockers such as Helix, Honeymoon Suite and Kim Mitchell. They also represented Canada in the World Popular Song Festival in Japan, where "Dance Desire" won the award for best song. Despite their success in Canada, and interest Stateside from Doc McGee (Management for Bon Jovi, Mötley Crüe and Skid Row); Q-Prime; and Chrysalis Records, they were unable to secure a US recording contract due to unrealistic demands from their record company. The follow-up album, Nuthouse, was recorded in Norway with Bjorn Nessjo at the production helm; one of Europe's most sought-after producers at the time. Unsatisfied with the final mix of the album, Haywire flew back to Canada and remixed it themselves. 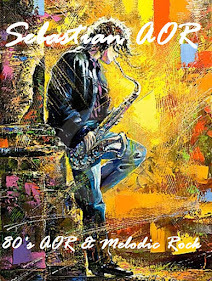 The final result was guitar-driven, had a much harder edge and was the direction the band had always wanted to pursue, rather than the soft-rock/pop-rock pap their record label thought was necessary. The videos for the first two singles, "Short End of a Wishbone" & "Operator Central" were the most expensive Canadian videos produced that year. Although it hit platinum sales it was a major change in musical direction and as a result, alienated some of the younger fans they attracted with their first two offerings...while it did garner major AOR radioplay and was well-received, the record company wasn't willing to nurture & develop the new direction and following, and as a result Attic shelved the album without a third video as promised - again. They produced one more album, 1992's Get Off, which was critically well-received, but still did not fuel the support from the record company (financial and otherwise) that they needed. Haywire compromised, and had the first two videos made for the price of one with the label promising a third for the single "Buzz". Once again, Attic did not deliver. This was quite short-sighted as the single reached No. 13 without video support (their highest charter, second only to "Dance Desire"). After contractual struggles, the group refused to re-sign with their label Attic. To fulfill their contractual obligations with Haywire, Attic released a greatest hits CD in 1993 entitled Wired: Best of . The band has had their albums re-issued on CD through Unidisc Music. In November 2006, Haywire were awarded the Music Prince Edward Island Lifetime Achievement Award. - Not to be confused with an American band of the same name that ran rampant for a few years in the early '90s, one of the most prolific groups from the East Coast was Haywire. Formed in Charlottetown, PEI in 1982 by Paul MacAusland on vocals, guitarist Marvin Birt, Ronnie Switzer on bass, David Rashed on keyboards and drummer Ron Leblanc, they toured the Maritimes, developed their style for the next few years and built a loyal following for their no-nonsense pop approach along the way. They gained added exposure by venturing into Ontario on several occasions and entered a Toronto radio station's 'battle of the bands' contest in '85. They took the prize money for "Jealousy" and recorded an independant 5 song EP. A hit in the Maritimes, they added to their popularity with more tours and won even more 'battle of the bands' contests. They shopped the new demos around, eventually signing with Attic Records in the spring of '86, home to such artists as Lee Aaron and Triumph. Brian Allen of Rose & Toronto was called in to produce BAD BOYS, released the same year. The lead-off title track paved the way for what was easily one of the strongest major debuts of the decade. The other singles "Standin' In Line" and "Shot In The Dark" were typical of the album - slick production of keyboard-oriented pop. Eventually selling 100,000 copies and going platinum, it capitalized on the AM pop market. In addition, their mere image was a natural match for MuchMusic and their videos were in constant rotation. After a cross-country tour, they returned to the studios for the follow-up, DON'T JUST STAND THERE. Released in '87 and again produced by Allen, it carreied on where its predecessor left off, but took a slightly different path. The lead single, "Dance Desire" had more guitar-work than anything on BAD BOYS but still managed to carry Haywire's stamp, becoming the band's first Top 20 hit. By the time "Black & Blue" was released as the second single the album had been gold-plated and the band was overseas winning more awards and on tour with the likes of Honeymoon Suite and Helix. Other noteable tracks from the record included "Hard Reaction", indicative of their apparent new attitude and the powerful "Man Enough". Despite being one of Canada's top live shows and nearly 200,000 total record sales, the American signing still eluded them. The next year and a half was spent writing material - then RE-writing it once or twice. The end result was 1990's NUTHOUSE. In an attempt to insert new blood, the band recorded it in Norway with Bjorn Nessjoe, one of Europe's most sought-after producers. It continued the band's growing emphasis on a harder, guitar-oriented sound. The singles "Operator Central", "Short End of a Wishbone" and "Taken The Pain" all helped maked NUTHOUSE the band's third straight gold record. But despite some finely crafted pop with an edge, there was still no American distribution deal in sight. They returned to the friendly confines of Toronto's Masterworks Studios to work on the next project. GET OFF hit the stands in 1993 and was seen-over by new producer Mark Berry. The 12 tracks marked their most musically diverse record to date. It spawned three singles, the title-track, the ballad "Wanna Be The One" and "Buzz" - one of the year's sleeper party hits. Along with "Hypnautica" and "All Touch, No Action", it actually impressed the critics - something the band wasn't particularly accustomed to. But the band's growing maturity came at a price. Expanding into new genres left the core audience confused as to what to expect and GET OFF marked the first Haywire lp not to turn gold.